The Graduate Center Library is named to honor a key figure in CUNY’s history. 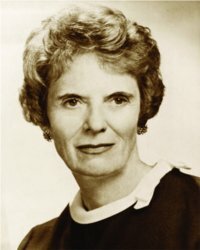 As we close in on sixty years of graduate education, it’s time to take an appreciative look back at the remarkable woman whose name the library bears. Mina Rees imagined CUNY’s library service, as well as its PhD programs, not as a storehouse of books that characterized traditional visions of a great research library of the day but as a network that invoked the potential of mutual, coordinated growth. Dr. Rees did not explicitly speculate about the massive shifts in library service that digitization, open platforms, and interlibrary lending would develop following her design. But she realized that the power of networked minds and collaborative projects, like those she coordinated during and after the war, would constitute a powerful, productive, and efficient structure for graduate programs and libraries serving the new City University of New York. Dr. Rees was a believer and an innovator in consortial higher education, and the library network that supports it. Her administrative structures and planning from fifty years ago extend excellent support of CUNY scholarship in particular, and higher education more broadly, today.